We’d love your help. 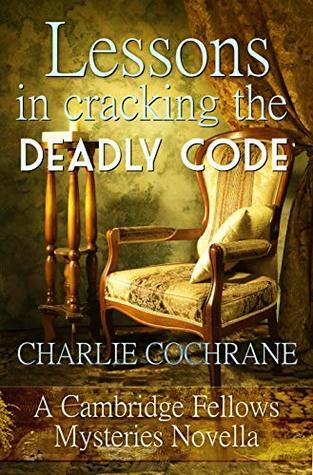 Let us know what’s wrong with this preview of Lessons in Cracking the Deadly Code by Charlie Cochrane. To ask other readers questions about Lessons in Cracking the Deadly Code, please sign up. A new entry in a favorite series of cozy mysteries set in the Edwardian era was just the thing. I was particularly tickled that this one stepped back in time to offer up a story that was chronologically much earlier in the series time line to before the older generation are off the scene. Jonty and Orlando get the excitement of a murder case and an old-style clue and treasure hunt right on the grounds of St. Bride's. Chief Inspector Wilson, his sergeant, Ariadne, and Dr. Panesar are on hand to as A new entry in a favorite series of cozy mysteries set in the Edwardian era was just the thing. I was particularly tickled that this one stepped back in time to offer up a story that was chronologically much earlier in the series time line to before the older generation are off the scene. Jonty and Orlando get the excitement of a murder case and an old-style clue and treasure hunt right on the grounds of St. Bride's. Chief Inspector Wilson, his sergeant, Ariadne, and Dr. Panesar are on hand to assist the detecting pair. As the revival of the St. Bride's Day traditional celebrations nears, signs of break-ins and crawling about the chapel roof have given Jonty Stewart and Orlando Coppersmith a new case. Is a dastardly crime afoot or is it just dunderhead pranks? OHMYGOD!OHMYGOD!OHMYGOD!OHMYGOD!OHMYGOD! A new Cambridge Fellows Mysteries is here and I finally got a chance to read it(holiday reading stopped me from getting to it sooner so I just told myself it wasn't out yet😉😉) What better way to start off the new ye As the revival of the St. Bride's Day traditional celebrations nears, signs of break-ins and crawling about the chapel roof have given Jonty Stewart and Orlando Coppersmith a new case. Is a dastardly crime afoot or is it just dunderhead pranks? OHMYGOD!OHMYGOD!OHMYGOD!OHMYGOD!OHMYGOD! A new Cambridge Fellows Mysteries is here and I finally got a chance to read it(holiday reading stopped me from getting to it sooner so I just told myself it wasn't out yet😉😉) What better way to start off the new year than with Jonty and Orlando on the case? I have been a huge fan of these boys since I first discovered Lessons in Love back in the summer of 2014 and I've said it before but I'll say it again: whether Charlie Cochrane has only a one paragraph holiday coda or 100 full length novels left in her for this pair, I'll be first in line to gobble them up. I don't know just what it is about this series that hooks me in but whatever it is, I'm all for it. As for Lessons in Cracking the Deadly Code, well the mystery is fun and yes I know there is a bit of death and destruction involved but "fun" is the best way to describe it. An added plus with Deadly Code, as it is set back in 1911, the elder Stewarts are back and ready to help when needed. We see more of Mr. Stewart aiding the boys but we get still have the ever feisty Mrs. Stewart showing her favoritism to Orlando too😉😉. I think that's about all I'm going to say to the mystery part of the tale as it is a novella, the tiny details are even more telling than with a full length mystery but I will reiterate that it is just plain fun and had me guessing right up to the reveal. As for Jonty and Orlando, well they are equally as fun, flirty, and more in love than ever. Yep, Lessons in Cracking the Deadly Code is a win win from the getgo! It has a little bit of everything, okay so there is no sci-fi or fantasy, but otherwise pretty much everything is here. Mystery, romance, friendship, flirting, death, humor -- oh yeah, Miss Cochrane has done her readers proud with this addition to the Cambridge Fellows. Speaking of the author, one of my favorite things about a Charlie Cochrane story is her attention to detail, to the little points that may or may not actually effect the mystery, and in the case of Cambridge her respect for the past just oozes off the page and yet the entertainment factor is never in jeopardy of being overshadowed by "getting it right". Definitely a win win from cover to cover. This is another installment in what has proven to be very funny and interesting mystery series. I’m rather fond of it and was overjoyed to find there is another addition to it. It’s freezing cold outside and Jonty and Orlando are hoping to amuse themselves with nice little problem. But what starts as set of unusual and confusing circumstances gets more serious when murder happens on the campus. As always the story is happily dancing along with numerous small jokes and sarcastic remarks despite dar This is another installment in what has proven to be very funny and interesting mystery series. I’m rather fond of it and was overjoyed to find there is another addition to it. As always the story is happily dancing along with numerous small jokes and sarcastic remarks despite dark subject matter. The murder fades in the background as the focus is more on our intrepid pair of heroes tying to solve the puzzle and ups and downs of college life. It has tongue in cheek resolution and I liked how the villain almost got away because of one simple lie everyone took as a truth at beginning. It’s cute little story bursting with charm, perfect to snuggle with. Sincerely hope to see more of it! Cochrane goes back to 1911, pre-Great War, for her latest Cambridge Fellows novella. While I enjoy seeing Orlando and Jonty still young and hale, there's a certain sadness in knowing what lies ahead for them. The mystery is a good one, and our two sleuths find themselves in a bit of danger as they forge ahead. There was one aspect that bothered me: the lack of concern displayed about the fact that a student has been murdered. Sure, they want to solve the crime and find the culprit, but there see Cochrane goes back to 1911, pre-Great War, for her latest Cambridge Fellows novella. While I enjoy seeing Orlando and Jonty still young and hale, there's a certain sadness in knowing what lies ahead for them. The mystery is a good one, and our two sleuths find themselves in a bit of danger as they forge ahead. There was one aspect that bothered me: the lack of concern displayed about the fact that a student has been murdered. Sure, they want to solve the crime and find the culprit, but there seems to be little sadness about the student himself, and the later theft of certain objects feels like it is given equal weight to a brutal murder. I get that this is a "cozy mystery" so the angst is by definition minimized, but it seemed just a tiny bit callous. From that review: "Yes! The mystery is afoot to borrow another sleuth's phrase in the latest Cambridge Fellows mystery by Charlie Cochrane. The author is not following along a specific timeline for her stories, happily for us who follow this series, so here some of our favorite characters like Jonty's parents can still be seen taking part in solving this quite puzzling affair. What a joy as I love them so..."
Well it’s Jonty and Orlando so what more needs saying! Snow, ancient traditions and a treasure hunt. The times were different in 1911 and you do get a feel for the times - the shock of Ariadne wearing tailored trousers! Puzzles to solve, a murderer to find, a number of red herrings and culprits a plenty. Because Charlie Cochrane couldn't be trusted to do any of her jobs of choice—like managing a rugby team—she writes. Her mystery novels include the Edwardian era Cambridge Fellows series, series, and the contemporary Best Corpse for the Job. Multi-published, she has titles with Carina, Samhain, Riptide and Bold Strokes, among others. A member of the Romantic Novelists’ Association, Mystery People a Because Charlie Cochrane couldn't be trusted to do any of her jobs of choice—like managing a rugby team—she writes. Her mystery novels include the Edwardian era Cambridge Fellows series, series, and the contemporary Best Corpse for the Job. Multi-published, she has titles with Carina, Samhain, Riptide and Bold Strokes, among others.